Although the work of Sofia Rusova as an early childhood educator and activist for Ukrainian and women's rights is becoming more well-known, she is still not a household name even among Ukrainians and Ukrainian Americans. Sofia Lindfors was born in the small village of Oleshnia in Chernihiv gubernia to a Swedish father and French mother. Sofia’s mother died of tuberculosis, and the remaining family moved to Kyiv when Sofia was ten years old. Five years later, her father died. In 1871, Sofia and her sister Maria established the first kindergarten in Kyiv. 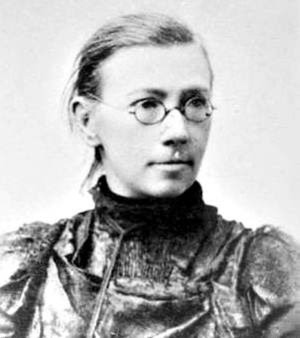 At the same time, Sofia became active in the “Old Hromada” circle of Ukrainian intellectuals, and through them she met the statistician, ethnographer, and Ukrainian activist Oleksandr Rusov, whom she married in 1874. The recently-married Rusovs were delegated the dangerous task of overseeing the publication of the first uncensored edition of Taras Shevchenko’s “Kobzar”. They traveled to Prague to prepare the text and supervise the printing, and, with the help of Ukrainian activists in Austro-Hungarian Galicia, successfully smuggled it across the border. Rusova continued her activism in the following years, including staging public readings of Ukrainian literary works and organizing underground Ukrainian schools. This resulted in her being arrested and imprisoned on several occasions for “revolutionary activities”. In the 1917-1919 period, she led the Department of Preschool Education within the Ministry of Education of the Ukrainian People's Republic, and also wrote the books “Preschool Education” (1918) and “In the Kindergarten” (1919). In them, she presented her distinctive approach to early childhood education, one that was based on western European ideas (such as those of her contemporary Maria Montessori) but adapted to the needs of early 20th century Ukraine. After the retreat of the Ukrainian People’s Republic into exile, Rusova emigrated to Prague, where she was professor at the Drahomanov Pedagogical Institute and president of the Ukrainian National Women’s Council. She spoke in support of Ukraine at conventions of the International Council of Women, the International Woman Suffrage Alliance, and the Women's International League for Peace and Freedom.